A summary of today’s show: Msgr. William Fay updates Scot on the work of the archdiocesan pastoral planning commission, the consultations they’re making on the state of the archdiocese today, and what shape their future discussions may take. They also debunk some of the inaccurate representations of their work that have appeared in some media reports. 1st segment: Scot welcomes all back to the show. He said in every organization, every one gives their input and the leaders makes choices on how to use the resources available. One of Cardinal Seán’s efforts over the past few years has been getting the key stakeholders in the archdiocese to answer the question how we can ensure the archdiocese is in good shape in the future. This year, Cardinal Seán appointed Msgr. William Fay and Deacon Chuck Clough to co-chairs of a pastoral planning commission. One the phone is Msgr. Fay. Scot asked him about his path since ordination 37 years ago. Msgr. Fay said he was inspired by a number of holy priests. He was born at St. Theresa’s in West Roxbury. His first priestly assignment was St. Rita’s in Haverhill. He did graduate studies in Washington, DC, and then taught for 14 years at the seminary. In 1995, he was asked to go back to DC to serve at the US Conference of Catholic Bishops, eventually as general secretary. He has been pastor at St. Columbkille since 2006. Scot asked him what the general secretary of the USCCB does. Msgr. Fay said at the time there 380 people who worked for the US bishops and dozens of committees. Each of those committees had staff members. It was his responsibility to ensure all the staffs were doing what they were supposed to be doing and following the mandates of the committee. Scot said there aren’t many priests whose experience gives them a national view of the work of the Church. Msgr. Fay said it was an amazing opportunity for him to see the Church in the US at work in 195 dioceses and eparchies with some 400 bishops, ordinaries, auxiliaries, and retired. Msgr. Fay said St. Columbkille’s was founded in 1871, the cornerstone was laid in 1872, and it was built in 3 years. The first wave of immigrants in the parish were Irish. The next wave was Italians from around the town of Monte Cassino. In the 1960s, there was a wave of immigrants from Cuba and there’s been a Spanish Mass celebrated every Sunday since that time. St. Columbkille’s school has a unique partnership with Boston College. Msgr. Fay’s predecessor as pastor worked with BC to show that they not only excel at college-level education, but could also train people to value education at all levels. They formed a corporation called the Partnership School, and this year they have an enrollment of 300 children. When they started in 2006, they had about 200. The children come from Allston and Brighton and many from struggling families. 2nd segment: Scot said every organization needs a long-term plan. Msgr. Fay said a pastoral plan for a diocese is like a road map set out for itself. It’s not just an answer to problems. You set out for yourself what the purpose and goal of an organization is. For the Church, it’s obviously bringing people to communion with Christ. Scot said this commission builds on the work of a pastoral planning committee that met 2005-2007 and the archdiocesan pastoral planning office. Msgr. Fay said there was a synod in Archdiocese in 1988 that created a new pastoral plan. Re-examining that plan hadn’t been done since then. When the archdiocese was re-organized in 2004 it became clear that we needed to do that. The committee led by Fr. George Evans made it clear we hadn’t been as attentive to planning as we should have been. They laid out the challenges the archdiocese will face and said we need ed to get actively planning in a conscious way. Scot said the Evans committee said that too often in the Church we focus on the here-and-now, instead of putting ourselves in a better position years now as well as focusing on the true mission of the Church. Msgr. Fay said the Evans committee gave the impetus to the reinvigoration of the pastoral planning office, which took a snapshot of what’s going on in the archdiocese and started to structure a response to the challenges we face. At a particular place in the process, the Cardinal asked how to take those to the next level and the pastoral planning commission was formed on February 2. Msgr. Fay said the commission includes a mixture of priests, laity, and a religious woman. While the group was familiar with each other, they didn’t know each very well, but they have come together and mix well to draw the best out of one another and move forward with a concrete set of recommendations to the Cardinal. Scot said when he was the list, he knew the priests were leaders and the other members were also very strong personalities with different perspectives. He thought that if this committee could come together with a recommendation, then he’d be convinced that this was a recommendation that could be implemented well. Msgr. Fay said the people have a sense that they working for something bigger than themselves. Msgr. Fay said Cardinal Seán asked them to take stock of the resources of the archdiocese, to look at the near and far-term challenges, and put forward recommendations how the resources should be allocated so that more people will drawn into the life of Christ. Scot said it’s not just financial resources, but particularly the human resources. Msgr. Fay said back in the 1950s and 60s, we had a Catholic population of 1.8 to 2 million people, 70% of whom were active. This past October, that percentage dropped to 17%. Close to 40% of parishes are struggling financially because they don’t have the number of people coming and supporting the parish. There are fewer priests today than we had 40 years ago. 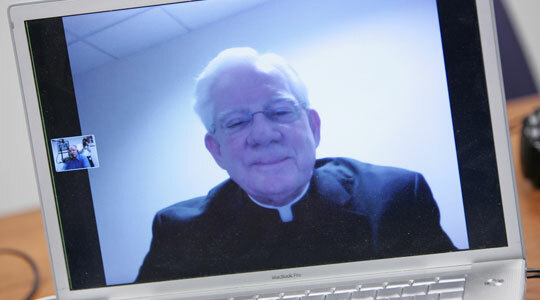 Part of the work of planning is not just allocating resources, but proactively strengthening them, like actively bringing people back to the practice of faith, to bring young men to the priesthood. Scot said God isn’t calling fewer men to priesthood, fewer men and women to religious life, or fewer men and women to married life; it’s just the response is not what it used to be. Msgr. Fay said the model of vocations the Lord used was to go out, recognize who He needed, and tell them, “Follow me.” Perhaps we need to go back to that model, “The Church needs you. Come and sacrifice.” He suggests going to young men in high school and college and asking them to pray for 30 days for God to tell them whether they are called to the priesthood. If we call the wrong man, then six years of formation in seminary will help him discern that call. Scot said the number of priests available in the future is one factor of pastoral planning. Another is Mass attendance. Also many of our churches aren’t where people are living and we’ve built a lot of churches for particular ethnic groups that aren’t there any more. There’s a need for greater offertory to support parish staffs taking on the duties that in the past would have been done by priests. Msgr. Fay said another is the drawing of the laity into the work of the Church. All of us has a call to holiness and people who are called to marriage or who discern being called in the single state, have to see how they can be engaged in the work of the Church in such a way that mission of Christ is advanced. It’s not just a matter of being receptive, but being active in our vocations. Msgr. Fay said a recent challenge is that the number of lay pastoral associates we have today is not increasing as it should. He said the new TINE program will strengthen catechesis, but we have to extend it to the whole lay pastoral associate in the Church. 3rd segment: Scot referred to an Associated Press story last Friday that said the Archdiocese is considering a major re-shuffle. The sense that Scot is that it portrayed the recommendation of the commission is near final, but that isn’t true. It’s still in the early consultation stage. They’ve been consulting with the Presbyteral Council and the Cabinet. The commission has been getting a sense of the direction they should move in with a first step. They have been taking great care with the future. They created a working paper for themselves to react to. they’re trying to imagine what the whole parochial life will look like. In the past, the archdiocese looked from the parish level, such as how many parishes we need. But now they’re looking at the people serving the parishes and look at them as teams. How ought they ensure the parishes have what they need as they are? Scot said he has found in his experience that in this kind of process you need to consult with a wide group of people, which may lead to people disseminating the information without context. One of the ideas in this working paper is to staff 80-120 pastoral service teams who would each serve 204 parishes. Msgr. Fay wants to make clear this is not a recommendation they’re making yet, but they’re exploring it. Every parish needs a pastor, but how will we have enough pastors for all the parishes we have. There are 291 parishes. Should we have less, based on the number of pastors we will have? Or is it possible for a pastor to be a pastor of 2 or 3 or 4 parishes, supported by a host of people who would be responsible for the parishes. Some of t he team would be parochial vicars or retired priests or religious or priests in education. There would be deacons, lay associates, catechists and more. They would be responsible for putting together a pastoral plan for their parishes. The key would be to bring the parishes together in a creative way. Perhaps they don’t need multiple religious education programs or multiple business managers. It’s up to the team to see how best they would work in the parishes. They might even make a recommendation to come together as one parish, not as imposed from above, but coming from among those in the parishes themselves. He emphasized that this is just exploring whether this could work in the Archdiocese of Boston. Scot noted that many of the headlines on the stories were certainly untrue. This is not about consolidating 291 parishes into 80 to 120 parishes. Msgr. Fay said it was about pastoral teams and no parish was envisioned as closing. That number of 80 to 120 was purposefully small as well in order to engender as much discussion as possible. Scot said this is about the way pastoral efforts are realigned, not about realigning parishes. Scot asked what assets and resources would stay at the parish level and what would be the pastoral teams. Msgr. Fay said everything would stay in the parish. You can’t say that one parish must forfeit assets to help a parish in the grouping that is struggling. Canon law would not allow it. They’re not combining the assets of all the parishes. However, where a parish in the past might have been able to afford a particular staff, maybe three parishes could. Scot said the AP story said the plan addresses a spiral of financial distress, but the approach of the planning commission is mission-based, not a response to a crisis. Msgr. Fay said the question is whether reaching out to people and inviting them to become active Catholics is happening, and how will we step into the future and see the Church continue to grow. Scot said some people are asking whether this pastoral plan will be “Reconfiguraton II,” referring to the process back in 2004. How did that inform the process of the pastoral planning commission. Msgr. Fay said the project of 2004 was a kind of downsizing, saying we can’t maintain what we have. From the beginning people realized we couldn’t have 350+ parishes. The difference today is that they don’t want to get caught up in that question. The key issue here is to ask how we’re going to bring ourselves together to focus on evangelization and use the resources we have in the future, becoming the prism by which we look forward as opposed to asking how we’re going to hang on. He finds it to be optimistic and it gives him hope and enlivens his desire to be a priest here in the future. Scot has found that there is a realization that some of our parishes don’t have the resources to be feel alive. No one wants to go to a big church and see it unfilled and doesn’t have a pastoral staff to offer ministries. What’s our vision of the parish of the future? It’s certainly a place that’s alive with human resources and financial resources. Many parishes have that in the short-term, but not in the long-term. Many people are not experiencing everything a parish can be. Msgr. Fay said it’s their hope that as parishes group there will be real excitement and hope to grow further and become vibrant communities. The key element is the pastoral plan for the future life of the parish by the pastoral team for the life of the parish for 2, 4, and 6 years and more. There will be more than 100 local pastoral plans that tie into the archdiocesan pastoral plan. It won’t be one-size-fits-all. 4th segment: It’s time to announce the winner of the weekly WQOM Benefactor Raffle. Our prize this week is a copy of the book “Images of Mary” by Fr. Alfred McBride. With insightful historical commentary and beautiful illustrations, Fr. McBride explores ten images of Mary and explains their evolution and influence. He traces her appeal through different eras and different cultures, offering a reflective journey that will help you rediscover the importance of Mary in your relationship with Christ and the Church. This week’s winner is Aline Clermont from Dracut, MA. Congratulations Aline! 5th segment: Scot asked Msgr. Fay what consultations have taken place and what will take place. Msgr. Fay emphasized that the people of the commission are very diverse and representative of bringing the best ideas of the whole archdiocese together. Every month when the presbyteral council meets, the commission provides an update of their work and gets feedback from them. Msgr. Fay has been consulting within his own vicariate (there are five regions in the archdiocese and each of them is broken into 4 vicariates). He brainstorms with the priests of his vicariate. He’s also brought their work to the Cardinal’s cabinet and they’ve received positive responses. For the future, ultimately every single parish will have an opportunity to weigh in on this. Then to start talking concretely about the kind of groupings they’re talking about. Scot said the work of the commission will require a lot of detail work. What principles might underly a pastoral service team model? Msgr. Fay said they’re still thinking about it. It will involve a balance between the groupings’ sense of what they need and what the Cardinal thinks will contribute to the future mission of the archdiocese. Obviously the priest personnel board will be vital to this. The pastoral teams will come together in organic ways that the people’s talents complement each other. What prayer does he ask of listeners for the work of this commission and pastoral planning? He asks everyone to pray where God wants us to be led as Church and to help us to be willing to let go of the familiar in order to be open to whatever His will may be. Great mind, that Msgr. Fay, and a very good man. Heard him speak a number of times, he’s been an excellent leader.